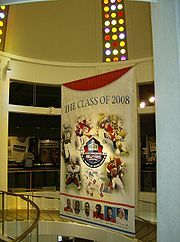 The Pro Football Hall of Fame is the hall of fame for professional American football, located in Canton, Ohio. Opened in 1963, the Hall of Fame enshrines exceptional figures in the sport of professional football, including players, coaches, franchise owners, and front-office personnel, almost all of whom made their primary contributions to the game in the National Football League (NFL); the Hall inducts between four and eight new enshrinees each year. As of 2018, there will be a total of 326 members of the Hall of Fame. The building remained largely unchanged until July 1993. The Hall then announced yet another expansion, costing US$9,200,000, and adding a fifth room. This expansion was completed in October 1995. The building’s size was increased to 82,307 square feet (7,647 m2). The most notable addition was the GameDay Stadium, which shows an NFL Films production on a 20-foot (6.1 m) by 42-foot (13 m) Cinemascope screen. In July 2017, Hall of Fame President David Baker announced an $800 million expansion project leading up to the NFL’s 100th season in 2020. Through 2017, all inductees except one, played some part of their professional career in the NFL (the lone exception is Buffalo Bills guard Billy Shaw, who played his entire career in the American Football League (AFL) prior to the 1970 AFL–NFL merger). Though several Hall of Famers have had AFL, Canadian Football League, World Football League, United States Football League, Arena Football League and/or Indoor Football League experience, and there is a division of the Hall devoted to alternative leagues such as this, to this point no players have made the Hall without having made significant contributions to either the NFL, AFL or All-America Football Conference. For CFL stars, there is a parallel Canadian Football Hall of Fame; only one player (Warren Moon) and one coach (Bud Grant) are in both halls. The Chicago Bears have the most Hall of Famers among the league’s franchises with either 33 or 27 enshrinees depending on whether you count players that only played a small portion of their careers with the team . For a more comprehensive list, see List of Pro Football Hall of Fame inductees § 2017 Finalists. Enshrinees are selected by a 46-person committee, largely made up of media members, officially known as the Selection Committee. Each city that has a current NFL team sends one representative from the local media to the committee. A city with more than one franchise sends a representative for each franchise. Usually, the representative is a beat writer for the major newspaper in that city, with some exceptions; for instance, the Atlanta Falcons are represented by Len Pasquarelli (who no longer writes for the Atlanta Journal-Constitution), and the Jacksonville Jaguars are represented by WJXT sports director Sam Kouvaris. There are also 13 at-large delegates (usually cities that lose NFL teams keep representation on the board; this category currently comprises St. Louis, Missouri and San Diego, California), and one representative from the Pro Football Writers Association. Except for the PFWA representative, who is appointed to a two-year term, all other appointments are open-ended and terminated only by death, incapacitation, retirement, or resignation. Fans may nominate any player, coach or contributor by simply writing to the Pro Football Hall of Fame via letter or email. The Selection Committee is then polled three times by mail to eventually narrow the list to 25 semifinalists: once in March, once in September, and once in October. In November, the committee then selects 15 finalists by mail balloting. Nine members of the Selection Committee also serve as a subcommittee known as the Seniors Committee to screen candidates who finished their careers more than 25 years prior. The Seniors Committee then adds two finalists from that group which makes a final ballot of 17 nominees. Committee members are instructed to only consider a candidate’s professional football contributions and to disregard all other factors. The Selection Committee then meets the day before each Super Bowl game to elect a new class. To be elected, a finalist must receive at least 80 percent support from the Board, with at least four, but no more than eight, candidates being elected annually. Once a contributor is inducted into the Hall, they cannot be banished and remain an inductee forever. According to staff, 46 members of the hall have been voted in with 100% of the vote; the most recent one being Brett Favre of the Green Bay Packers. The enshrinement ceremony is usually held during the first full weekend in August. An enshrinement festival is held throughout the week in Canton leading up to the enshrinement ceremony. 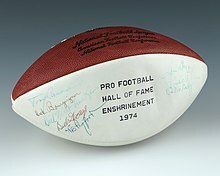 Enshrinees do not go into the Pro Football Hall of Fame as a member of a certain team. Rather, all of an enshrinee’s affiliations are listed equally. While the Baseball Hall of Fame plaques generally depict each of their inductees wearing a particular club’s cap (with a few exceptions, such as Catfish Hunter and Greg Maddux), the bust sculptures of each Pro Football Hall of Fame inductee make no reference to any specific team. In addition to the bust that goes on permanent display at the Hall of Fame, inductees receive a distinctive Gold Jacket and previous inductees nearly always wear theirs when participating at new inductee ceremonies. Previous induction ceremonies were held during the next day (Sunday from 1999–2005, Saturday in 2006), situated on the steps of the Hall of Fame building. Starting in 2002, the ceremony was moved to Fawcett Stadium, where it was held from 1963 to 1965. Since 2007, the enshrinement ceremony has been held on the Saturday night before the Hall of Fame Game. The Pro Football Hall of Fame Game, an annual NFL preseason opener is held the day after the enshrinement ceremony and officially kicks off the NFL preseason. The “Other Leagues” display includes the USFL; inductee Jim Kelly’s jersey is in the foreground. The Pro Football Hall of Fame uses only media representatives to select inductees. This, along with its policy of inducting only a maximum of seven players a year (six in certain years past), with a current maximum of two “senior” candidates and five “non-seniors,” has been criticized by sports columnists, former players, and football fans. Such critics would like to see solutions such as expanding the number of selectors, rotating panel members on and off the selection committee, and allowing former players to participate in the voting. The small number of candidates elected each year has helped foster what some perceive as an inequality of representation at certain positions or in certain categories of player, with defensive players in general and defensive backs and outside linebackers in particular, special teams players, wide receivers, deserving players who primarily played on bad teams, and those from the “seniors” category, being slighted. This has included a 2009 New York Times article which criticized the Hall for not including punter Ray Guy on its ballot, also noting that the Hall did not have an inductee at the time representing the position. (At least two inductees, Sammy Baugh and Yale Lary, punted in addition to playing other positions.) Guy was eventually inducted as part of the 2014 class for the Hall of Fame. There has also been criticism that certain players get overlooked because their team underproduced during their careers. The Pro Football Hall of Fame is unique among North American major league sports halls of fame in that officials have generally been excluded from the Hall; only one, 1966 inductee Hugh “Shorty” Ray, has been enshrined. The National Baseball Hall of Fame and Museum, Naismith Memorial Basketball Hall of Fame and Hockey Hall of Fame have each inducted game officials as members. In part to rectify the lack of officials and other off-field contributors, the Hall of Fame added a “Contributors” committee beginning with the class of 2015, which will nominate officials, general managers, owners and other positions that have historically been overlooked by the committee at large. Another prominent absence from the Hall is sports-journalist Howard Cosell, who has yet to be awarded the Pete Rozelle Radio-Television Award despite his well-known association with Monday Night Football. An August 2010 Sports Illustrated article hints that Cosell may have even been “blacklisted” by the NFL. In 2015, the exclusion of Marvin Harrison from the yearly induction caused some to question the effect politics[clarification needed] has on the induction process. Harrison ranks 3rd all-time in receptions, was selected to the Pro Bowl eight times among many other individual records. He was also named as the hardest receiver to cover by veteran cornerbacks Champ Bailey and Charles Tillman. The duo of Harrison and quarterback Peyton Manning also hold the record for most receptions, touchdowns, and yards between any quarterback and wide receiver combo. Critics argue the induction committee is allowing age and wait time to overshadow production. Harrison was inducted into the Hall of Fame as part of the Class of 2016. As the late 2010s approached, a number of controversial and polarizing figures began to reach eligibility for the Hall. Terrell Owens’s exclusion from the Hall in his first two years of eligibility despite his strong individual statistics was a subject of public debate.